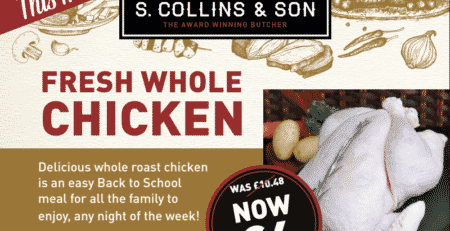 Home » News » Offers » 2 for £12 Ready Meals Offer Continues! 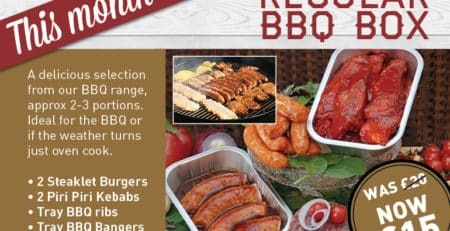 With our ever expanding range of new products going into our Gemini counter, we thought it best to continue our brilliant offer on our fantastic Ready Meal range! You can get your choice of our entire range of beef, pork, lamb and poultry ready meals in our super 2 for £12 promotion! 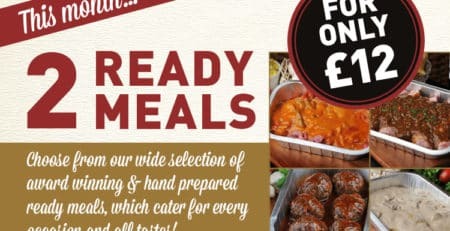 Fantastic meals at a fantastic price, these award winning dishes are the bees knees when it comes to family meal planning! Captivating nearly every taste we offer, these dishes have a selection of only the best Scotch beef, pork, lamb and chicken! Try the popular Bombay Chicken, or go for the rich Beef Bourguignon! How about the nippy Peppered Chicken or the sweet Lamb Curry? These choices, and more, are waiting for you at your favourite butchers!